Developed to deliver repeatable ultra-broadband performance up through 40 GHz, Series GLM and GLN are suited for semiconductor data communications, receiver optical sub-assemblies, trans-impedance amplifiers, and test equipment manufacturers. Units offer flat frequency response, low insertion loss, and optimized matching over multiple octaves of frequency spectrum. Rated for -55 to +125Â°C, lead-free inductors have powdered iron core and RoHS-compliant terminations. 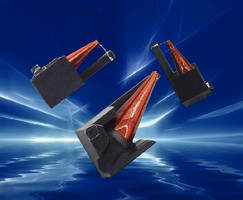 GREENVILLE, S.C. -- AVX Corporation, a leading manufacturer of advanced passive components and interconnect solutions, recently developed two new high frequency ultra-broadband inductor (UBL) series. Designated the GLM and GLN Series, the unique components provide extremely low insertion loss and excellent matching over multiple octaves of the frequency spectrum. Developed specifically to deliver repeatable and reliable ultra-broadband performance up through 40 GHz, the new GLM and GLN Series surface mount broadband inductors provide maximum inductance in a compact physical space, making them ideal for applications including: semiconductor data communications, receiver optical sub-assemblies, transimpedance amplifiers, and test equipment manufacturers. "The new GLM and GLN Series inductors from AVX provide ultra-broadband performance in addition to ultra-low insertion loss, excellent return loss, and extreme part-to-part performance and repeatability, enabling their employment in both ultra-broadband decoupling networks and bias tee applications in optical communications systems, as well as in equipment using high speed digital logic," said Larry Eisenberger, senior marketing application engineer at AVX. Available in two sizes, M and N, the GLM and GLN Series are rated for -55oC to +125oC and offer several critical performance advantages including: flat frequency response, excellent insertion and return loss, a rugged powdered iron core, and lead-free, RoHS compliant terminations.